Professor Longhair looms over the stage at Tipitina's. When you have a plan and it doesn’t work out, that can be disappointing. But when you don’t have a plan and just go with the flow, sometimes, some pretty special things happen. Take for instance my recent trip to New Orleans. My friend Cara sent me an email back in August with the subject line: “The Mavericks at Tipitina’s on Tues. Oct. 8, 8:00 PM.” Inside the email was a link to the club’s website. My initial reaction was, “Well, that would be really nice but I can’t do that.” And then I went back to what I was doing. But a little while later I went back to the email. And then again. I probably looked at it five times in the next few hours and had a little debate going on in my head. I came to my senses and realized there was nothing holding me back, and so Cara and I made our plans. She would drive in from Florida and pick me up from the airport. I made my flight reservations and we found a hotel in the Garden District. We were ready! I was pretty pumped about seeing the Mavericks again. After splitting up in 2004, they reunited last year and began touring in spring 2013. 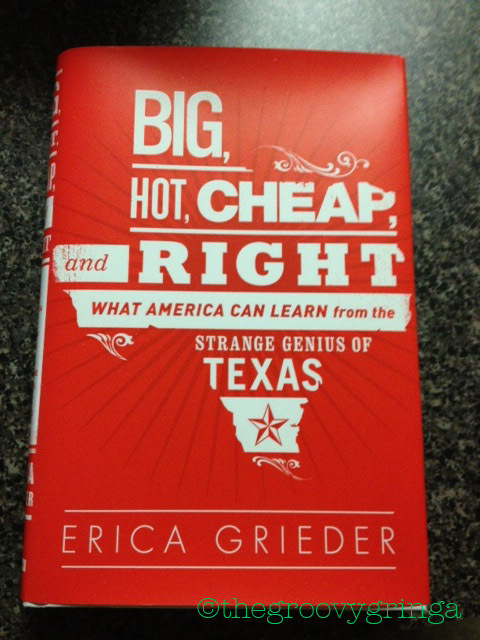 Cara and I had seen them on that tour – me at Sam’s Burger Joint in San Antonio and Cara at the Fox Theatre in Tucson. And as luck would have it, the opening act in New Orleans was the same as in the spring – one of my very favorite musicians and a talented songwriter, Seth Walker, who now lives in the Crescent City. 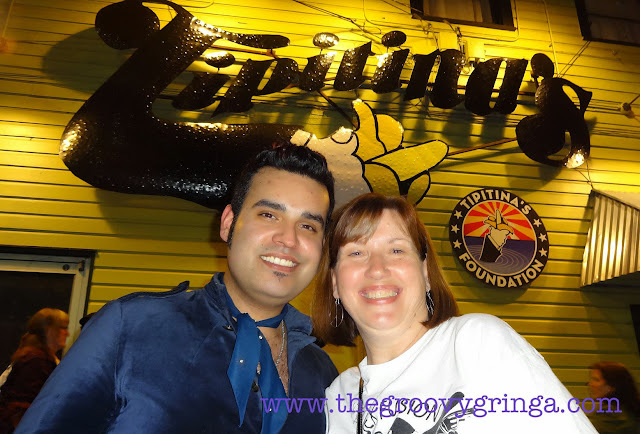 And so we found ourselves ready to see the Mavericks again, but this time, at the legendary Tipitina’s. It’s far from the boozy streets of the French Quarter, at the corner of Napoleon and Tchoupitoulas in the area known as Uptown New Orleans. Established in 1977, the club is dedicated to a New Orleans legend – Henry Roeland Byrd, better known as Professor Longhair or Fess. 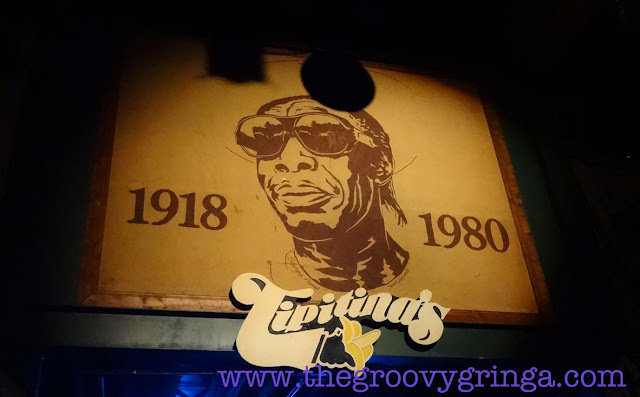 According to the Tipitina’s website, the professor “created a unique style by fusing rhumba rhythms with boogie-woogie, blues and southern R&B.” He influenced such musical luminaries as Dr. John, the Neville Brothers and Allen Toussaint. Even the name of the club comes from one of the professor’s songs. And even though Professor Longhair died in 1980, there’s no denying his presence is still strong, with his lifelike image looming over the stage, a beacon of light to help music fans find their way. 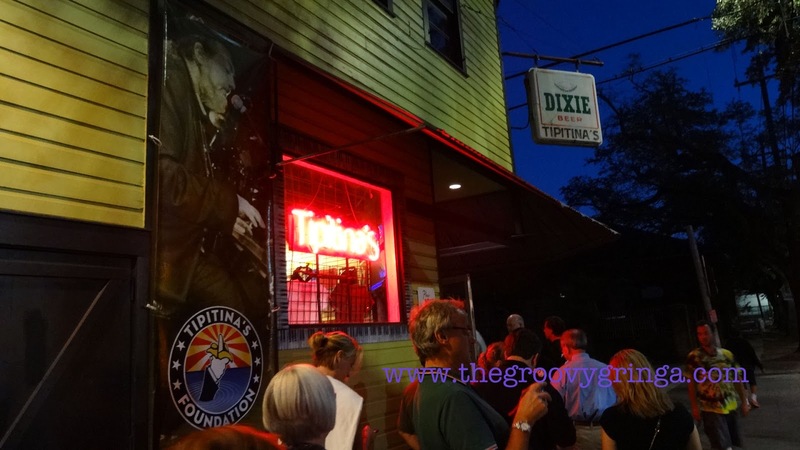 People wait to enter Tipitina's for the Mavericks show Oct. 8, 2013. As expected, the show was great! There aren’t many people I will stand on concrete for, much less for four hours, believe me. An added treat was getting to talk to band member Michael Guerra after the show. Michael’s a Los Angeles native who now calls San Antonio home. He is one busy musician, primarily playing accordion for the Mavericks, but also bajo sexton and guitar. As if that isn’t enough, he also fronts the Michael Guerra Band; they released their first CD this year. And, like Seth, is one of those artists who is passionate about his craft and appreciates his fans. Me and Michael Guerra after the Mavericks show. After our evening at Tipitina’s, the rest of our visit flew by, and before we knew it, it was Thursday, time for both Cara and I to head back to our respective homes. But first, we were going to experience a little more New Orleans cuisine. We had decided on an early lunch at Café Reconcile, not even a half-mile from our hotel. After checking out, we walked up to St. Charles Ave. From there, we could either walk straight up Terpsichore St. and turn left on Oretha Castle Haley Blvd., or turn left on St. Charles and then walk up Euterpe St. We decided on the first option. Volunteers work on the house on Terpsichore Street. Walking up Terpsichore was a series of highs and lows. Many of the homes were in various states of renovation. Some were well-loved. Some had clearly not been touched since Hurricane Katrina. Then we came upon a house that had a flurry of activity. 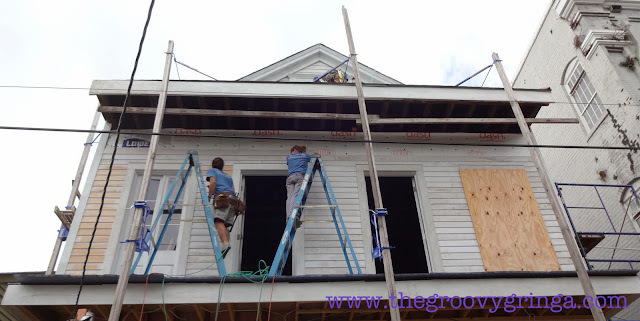 The area was fenced off and workers were busy on both levels, painting, sawing, carrying sheetrock. I stood there mesmerized, watching, smiling, happy that the home was getting another life. I was only half-paying attention. My friend Cara with Pat Byrd. “Oh my God!” Cara and I both exclaimed. “We were just at Tipitina’s Tuesday night. 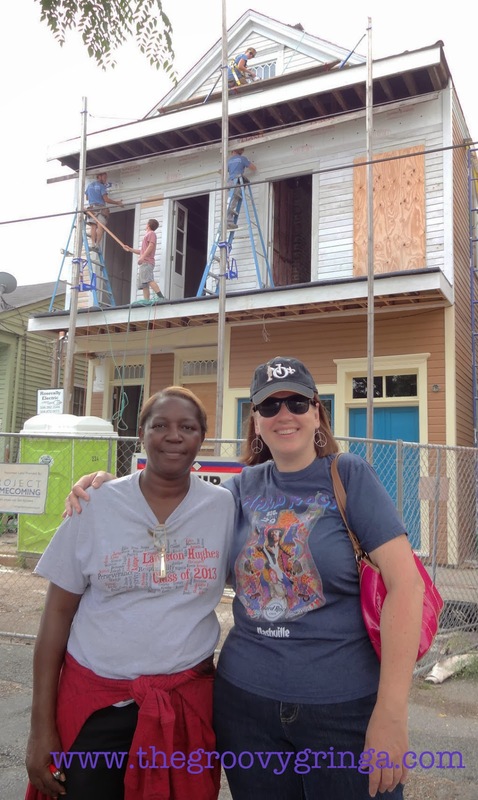 And I’m wearing the shirt I got there,” Cara said, pointing to her Tipitina’s T-shirt. The banner in front of Professor Longhair's house. Wow, for being a journalist, I sure am unobservant at times. The woman we’d been talking to was Pat Byrd, and the last several years have been difficult for her. 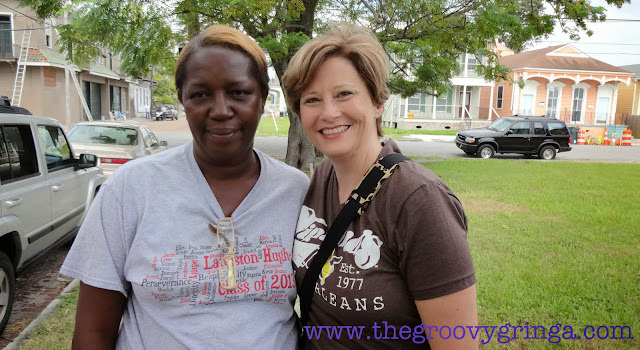 She’s essentially been homeless since Hurricane Katrina heavily damaged the house. She’s been beset with financial woes and ripped off by contractors. But there is light at the end of the tunnel, and faith has kept her strong. 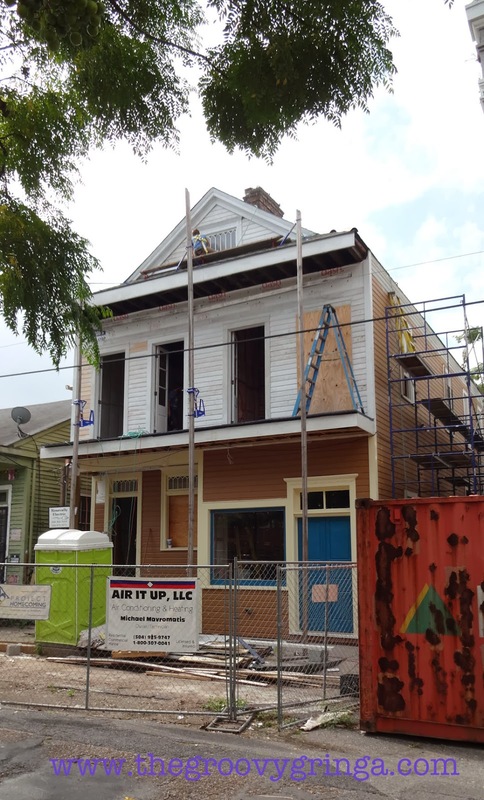 She’s hoping the renovation will be done in time for next year’s Mardi Gras. Me and the professor's daughter. I hope so, too. And I hope Pat gets to spend many comfortable nights in this home that’s being rebuilt with love and care. In fact, if you want to be a part of that love and care, you can volunteer with Project Homecoming. 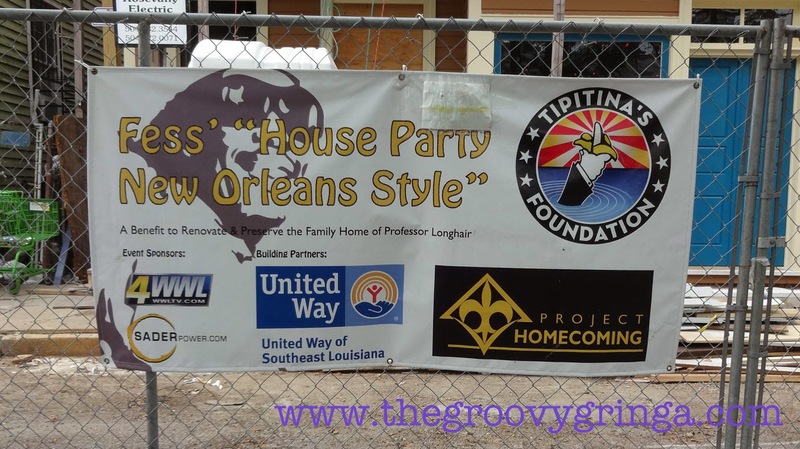 In addition to Pat’s home, they have many worthy projects going on across New Orleans. Just check out their website for more information. Call it fate. Call it a coincidence. I’m thankful for whatever brought me to the house on Terpsichore. I hope you find yourself on that street someday. You don’t need GPS. You just need to follow your heart. Professor Longhair's house on Terpsichore Street. This is been all around settled law and experts must need to look for each conceivable position which is even thought to be of most extreme significance and get idea from here for manage project. keep it up!